This is my next recommendation which is again a popular product, available for free in the official WordPress repository. It offers real-time shipping integrations, various sort of product listings with tons of customization and even supports active translation among 45 known languages across the globe. It even packs a shopping car, which is fully functional to help you set up an e-commerce shop. Moreover, it even supports online payment gateways, all popular ones. 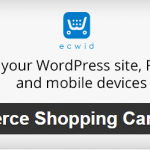 Just like the previous plugin, Ecwid is also available in a premium version, which you can opt for to get improved features, performance and dedicated support from the developer. It supports Facebook e-commerce norms, keeping everything perfectly integrated between Facebook and WordPress storefronts. The design part is totally responsive, and the mobile friendly feature is built-in to ensure proper functionality. It even supports Retina display powered iOS devices. It packs few special feature like automatic backup and upgrades to ensure proper security of everything. 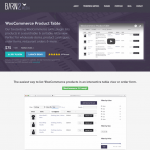 The plugin works with other e-commerce stores like Google Shopping and eBay.